Today I am here with Rajma Pulao recipe. This flavorful one pot meal is vegan and gluten free. 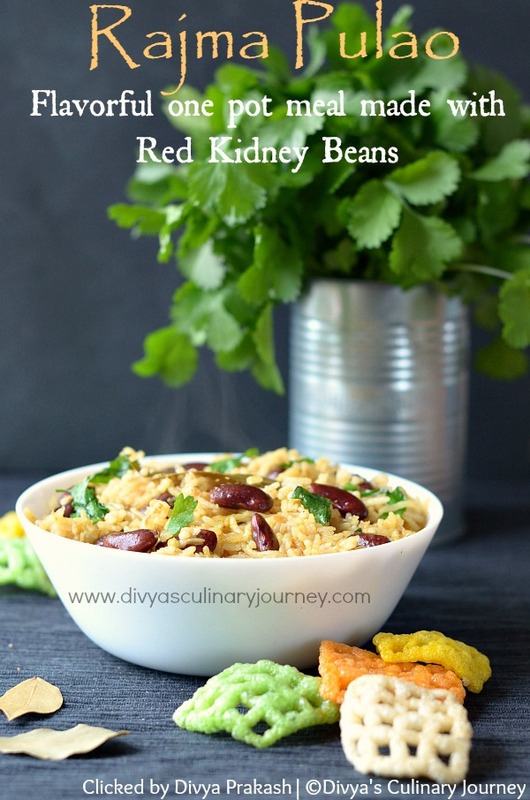 From start to finish, it took less than 30 minutes to prepare this pulao except for the soaking time for dried red kidney beans which requires minimum 4 - 6 hours. If you are using canned ones, you don't have to worry about that too. I cooked this for a weekend lunch and my family loved it so much. I served it with fryums (the one in the picture), yes it is 'not so healthy' of an option for a side dish but still our family loves it, so once in a while it is ok, I guess. I have prepared this pulao using bay leaves from Schwartz They have wide range of spices, herbs, seasonings and recipe mixes. I happened to pick this one from our local Sainsbury store and loved it. Yet to try the other products though, which I will do it soon. 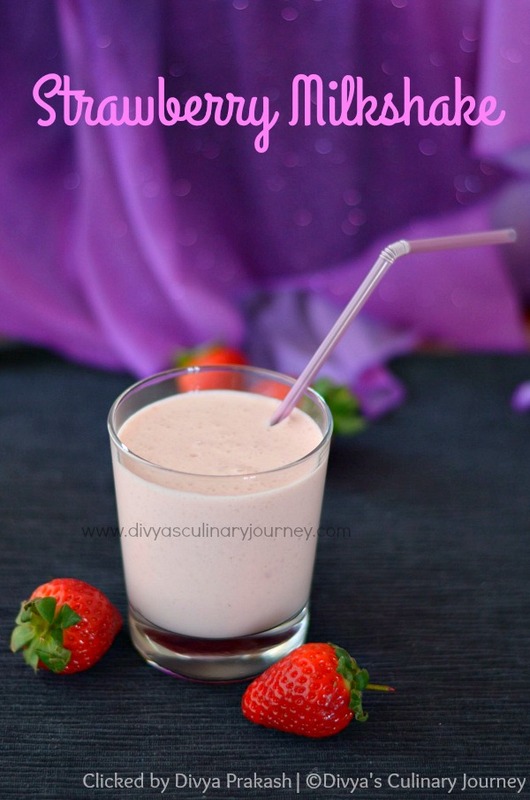 Today I am here with an easy recipe for Strawberry Milkshake. Usually milkshakes are made by adding ice cream and I didn't want to add ice cream but still wanted to make a creamy milkshake. The secret ingredient I chose is heavy cream. Milkshake came out so creamy and delicious and my kids loved it so much. Today I am sharing here with the lunch I cooked this weekend. 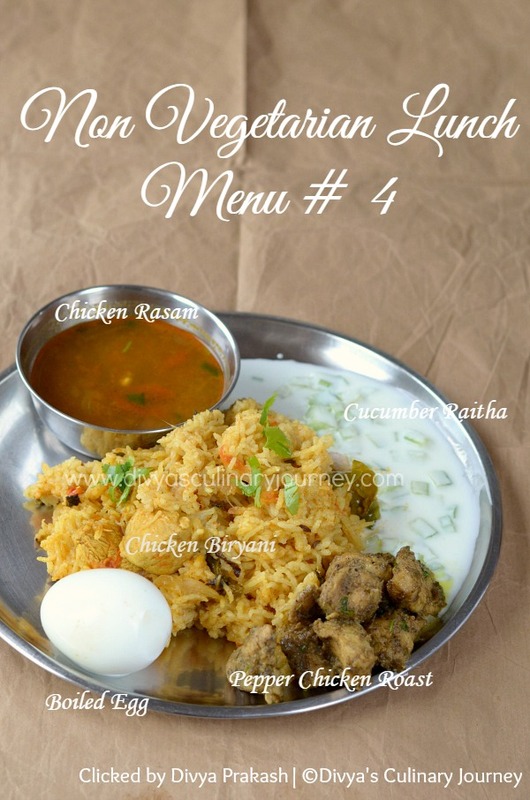 The menu consists of all Chicken dishes and I have posted the recipes in the blog and here I am sharing the links to the recipes and few other tips in case if you plan to replicate the menu at home. It took almost 1 hour 30 minutes to 1 hour 45 minutes for me to cook and serve this lunch. I did not prepare any special dessert, but we had store bought ice cream. 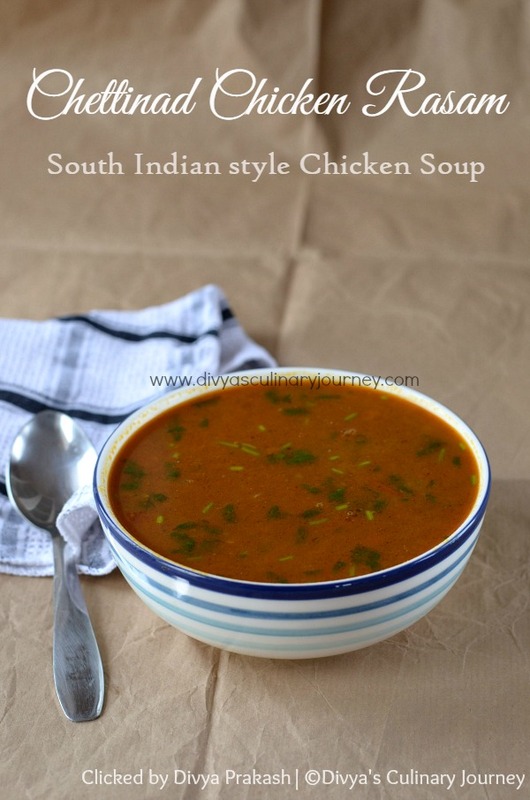 Today I am here with Chettinad Chicken Rasam Recipe. This spicy rasam is made with freshly ground spices and can be had as a remedy for cold. I made this for this Sunday lunch and my family loved it. With the weather still on the colder side, this is what we needed. This rasam can be served as a soup too. Usually chicken with bones are preferred to make this rasam, then the chicken pieces can be strained and then they can be fried and served as chicken fry too. But I used boneless chicken pieces and cut them into bite sized pieces and then cooked the rasam and didn't strain it as my kids like those chicken pieces from rasam. Serving it with rice or having it as a soup, is your choice. Either way it is going to taste delicious! Today I am here with Methi Chicken Recipe. 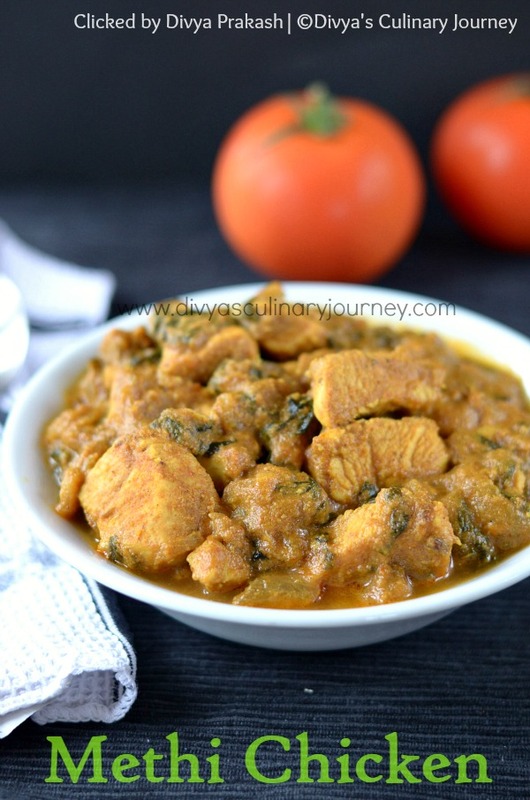 This Chicken Curry is made with fresh fenugreek leaves. I love Methi so much that we get fresh methi from the nearby Indian store often. I regularly make methi thepla, aloo methi, methi sambar or a simple stir fry with it. When there is leftover, I would use them to make methi chicken too. As I usually make them around the weekend I do not get time to click or post it. Except for the methi thepla and aloo methi I posted couple of years ago. So this time when I made Methi Chicken, I didn't want to miss the chance. So I made sure I clicked enough pictures before serving it to the family for lunch. They really had to patiently wait for it to be served which was really hard for them because of the tempting aroma from the curry. The fresh fenugreek leaves and the spices in the curry makes it flavorful and appetising. 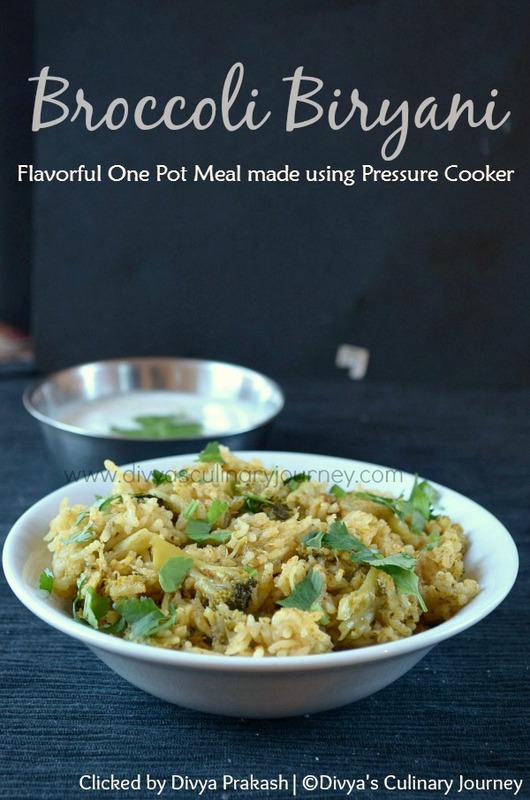 It is easy to make too and can be served with rice, pulao, roti / naan or any flat bread. Today I am here with Vathal Kuzhambu Recipe. 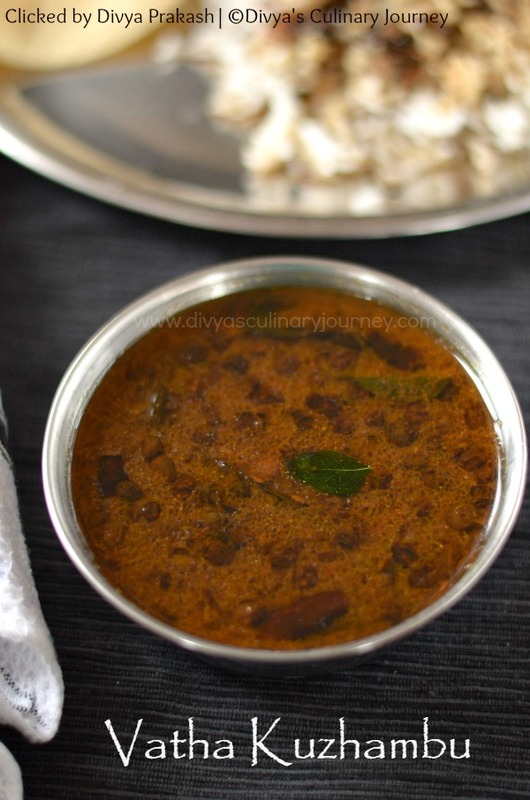 This is a traditional South Indian, tamarind based gravy made with sun dried vegetables. Typically any sun dried vegetables can be used, but the popular ones used are Sundakkai (Turkey berry) Vathal & Manathakkali (garden night shade berry) Vathal. I have used Manathakkal Vathal here for this gravy. Today the recipe I am going to share a simple recipe for making vatha kuzhambu using Sambar powder and it is made without onion and garlic. This gravy is served with rice and side dish of your choice. But the best side dish is Sutta Appalam (roasted papadum). Bread Bajji recipe | How to make Bajji with Bread? Today I am here with easy to make bajji using bread- Bread Bajji. The bread slices are dipped in batter and are deep fried and served warm. Usually Bajji is made with vegetables like onion, potato, brinjal or plantains. But it can also be made with bread. This can be a great evening snack with tea. 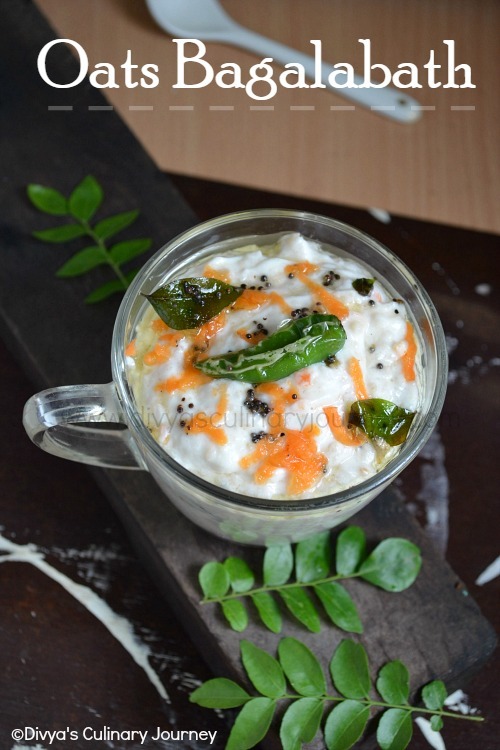 You can serve it with coconut chutney or tomato ketchup like I did. 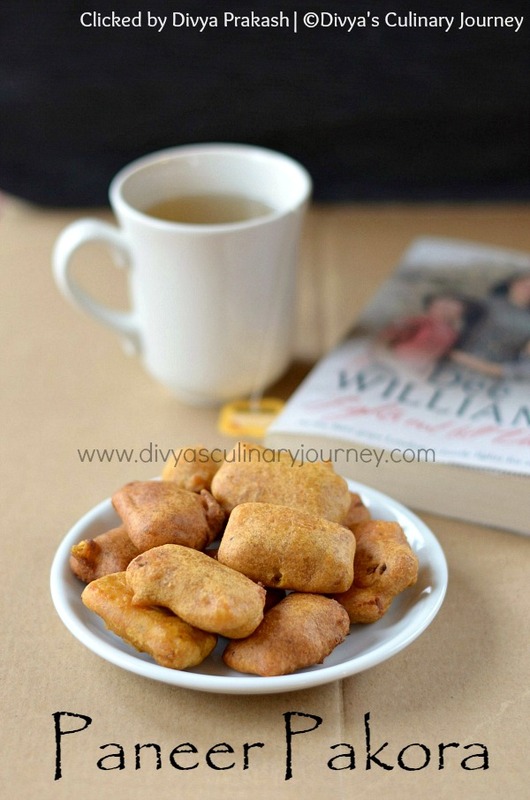 This is a easy recipe the key for perfect bajji lies on the consistency of the batter and the temperature of the oil. The batter should neither be too thick nor too thin. While dipping in the batter, make sure it is covered evenly on all the sides and also the coating should not be thick, if there are excess batter shake them off. Then while frying maintain the oil in medium heat to ensure even cooking. 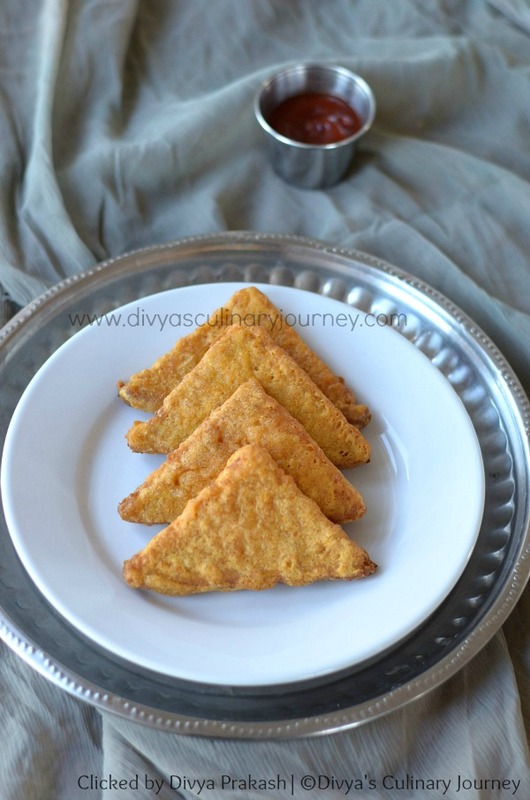 Just with these things in mind, you can get perfect bread bhajji every time.